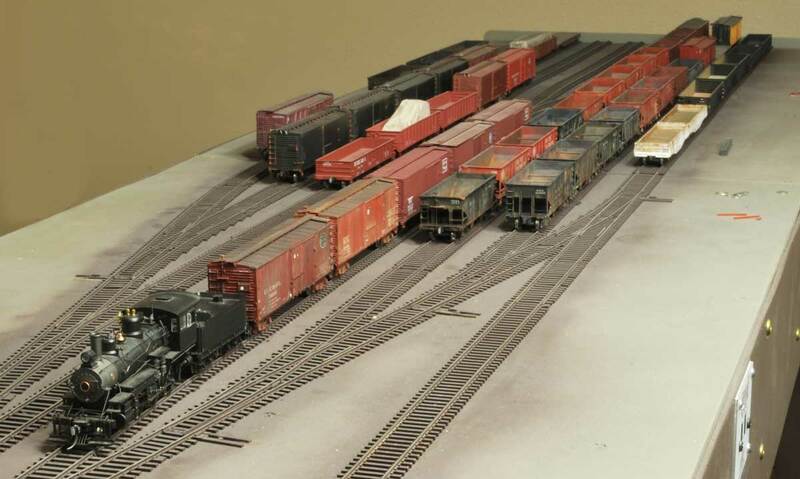 Seven HO scale box cars were recently painted for the Wheeling Freight Terminal. A couple days of warmer weather made it easy to open the garage door and fire up the airbrush. While there are seven cars, only three paint colors were used. I try to paint multiple cars the same color to minimize clean up time and effort. Click on any image here to review a large size. A busy yard before an op session. The first B&O Wheeling Freight Terminal operating session of 2015 was held on January 30th. Mike came in from Las Cruces to participate. I think this was the fifth session since operations began in late June 2014. 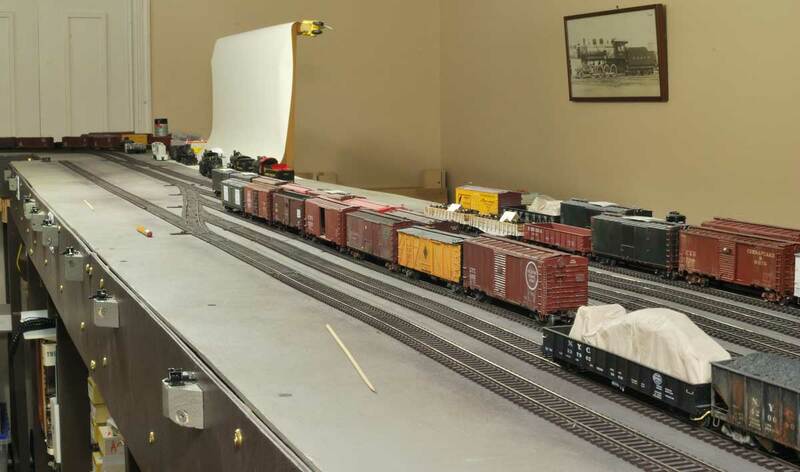 While the layout is not large, we did move 71 freight cars in a three hour session. Some of the operating methods have altered since the first session and I wanted to share these ideas. This will probably end up as two or three parts so I don’t bore anyone with too much detail in one sitting. A switcher works a string of cars at the freight house. New Year’s Eve is a time when many people assess the last twelve months and look ahead to the next year. Goals are set and promises are often made. Let’s take a look around the blog and the hobby room to see what has happened in 2014. I like a year end reviewing as the number of projects and activities often surprises me. While I did not make as many blog posts as in 2013, I kept pretty busy with my layout and Mike’s layout in Las Cruces. I attended at least one operating session a month and I finally hosted a few sessions on the B&O Wheeling Freight Terminal. These become more satisfying each time and are a major reason why other projects keep moving along. I’ve also been attending the monthly meetings of our local NMRA division, the Roadrunner Division. It’s been fun to interact with the other members and share tips and techniques. I’ve brought back at least one new idea from each of the meetings. I also traveled back to Pennsylvania last spring for the Valley Forge Railroad Prototype Modelers meet. It was great to see a bunch of old friends, take in presentation details, and operate on a couple of the layouts open for the event. I won’t offer up my plans for 2015, but I do have three major projects and goals that I hope to achieve. Details will be shared here, of course. 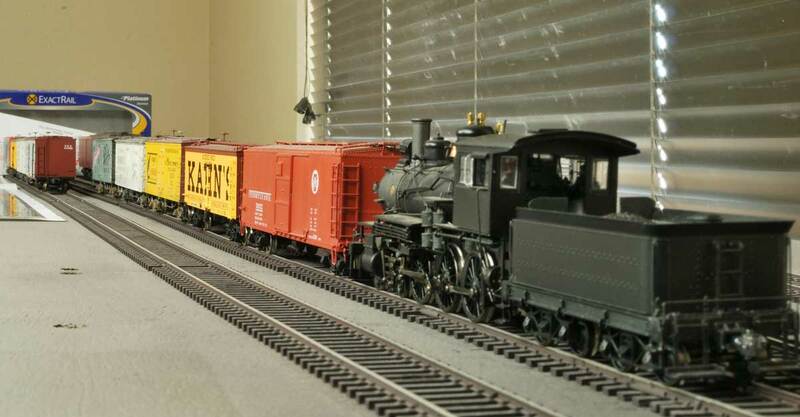 I also look forward to attending the RPM East event near Pittsburgh in late March, as well as the June NMRA Rocky Mountain Region convention in suburban Denver, CO. I’m most certain there will be more operating session details shared here, as well as freight car kit builds, and weathering factory output. I hope you have set a few goals for the New Year. Railroad modeling becomes more enjoyable as we meet new challenges. Thanks for stopping by. Your questions and comments can be posted below. Please follow the instructions so your comment comes through. All comments are reviewed and approved before they appear. The quiet before the storm of the first op session. My B&O Wheeling Freight Terminal layout has reached the point where I can hold an operating session. All of the track switch controls have been installed and adjusted to proper working order and a few track gauge issues have been corrected. It was time to make the leap of faith. My friend Mike committed to the initial shake down session so I was now locked in and needed to prep. This will be the first op session on a layout in my home since the summer of 2001. Where have the years gone?